In India, April 14th is celebrated as the birthday of Dr. Bhimrao Ramji Ambedkar, the father of the Indian Constitution, also known as Babasaheb. Dr. Ambedkar wrote the Indian Constitution in 1950 but the core issue, still after 58 years, is still on a dilemma regarding social economical issues. Thousands of violent acts have occurred in India during the last 50 years among different castes and people are still divided, plus around 70% of the population still lives under poverty. The root cause of the problem is the Hindu faith of punarjeevana (birth again) that says an individual is born into a higher or lower caste as a result of acts performed in a previous life. These caste divisions create imbalance in society, contradiction and division. Social injustice, which itself is a product of the Hindu religion - these are the teachings of Hindu sacred books. Due to this teaching of the Hindu religion, the high class exploits lower castes. Status quo, education, and economic activities are restricted for a certain class only. Lower castes are exploited in all forms, including insults and harassment. He introduced article 16(4), 335, 320(4) for reservation for backward classes. Now the total reservation quota stands at 45% in many states of India for SC, ST and OBC. Increased percent of lower caste in government jobs and reserved seats in education institutes, giving scholarships and other type of benefits or can say give dominance lower caste to the upper caste. Present reality due to the reservation policy lower caste increase tenfold in 60 years in India. But still 5% in I-class job in comparison of 90% upper caste. Atrocity against SCST After 60 years of untouchability it is still practiced in many forms. Statistics of 2001 show there were 24,792 registered criminal cases against backward classes. Practice of manual cleaner of sewer is still common in which is performed by the lower caste persons only. The Silicon Valley of India has 10,000-15,000 scavengers after 1970. The manual scavenger lives isolated from other Hindus and even they not allow to share water. Due to the atrocities against the lower castes conversation rate is very high in lower caste to Buddha, Christian or Islam. Ambedkar tried to solve the Indian caste problem by their own mind by reservation policy but after 60 years the problem is on same stage and society is being divided into lower and upper castes, and right now India is on the mouth of a volcano. Due to a Ambedkar-type of solution, at present, upper castes feel threatened and that’s why they are not allowing lower castes to gain any room of dominance on them. Caste-related problems need more comprehensive solutions, which is not achieved by giving dominance to one caste over another like Ambedkar did. If I understand the above article, it attempts to tie the Hindu religion and its tolerance of the caste system to poverty in India claiming that poverty encompasses some 70% of the population. That is incorrect: if one consults the latest statistics, poverty in India is more like 25% of its population. Although the author does not mention China, often enough the comparison with China buttresses this argument by pointing out that in China where religion is not encouraged or protected, often persecuted as is the case in Tibet, poverty has practically disappeared. Let us see, if this is the case. In India, contrary to what Mr. Khan asserts the percentage of poor is not 70% (which was the case in the early 80s) but more like 25% with a total population of poor of 236 million. In fact, if one goes back to the early 80s both countries had some 70% poverty. Logically one can only state that both countries have made considerable economic progress in the last twenty years or so, albeit China has done 10% better than India. Logically one can declare that dictatorship is more beneficial economically but that is an assumption that remains to be proven in regard to India vis a vis China. For the moment it remains a mere ax to grind against religion which is recognized as part of the cultural patrimony of India in its constitution, albeit with separation of Church and State. The real difference is that India declares itself a sovereign secular democratic republic and, unlike China is in fact such, as spelled out in its constitution written by an untouchable Mr. Ambedkar. Here Jefferson’s reminder comes to mind: those who give up their freedom for economic advantage deserve to lose both. Mahatma Gandhi coined the term "Harijan", a euphemistic word for untouchable, literally meaning Sons of God. 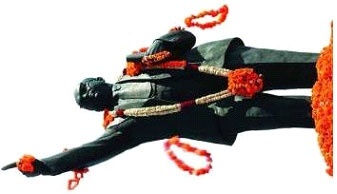 B. R. Ambedkar, born in Hindu Dalit community, was a heavy critic of the caste system. He pioneered the Dalit Buddhist movement in India, and asked his followers to leave Hinduism, and convert to Buddhism.India's first Prime Minister, Jawaharlal Nehru, based on his own relationship with Dalit reformer Ambedkar, also spread information about the dire need to eradicate untouchability for the benefit of the Dalit community. Another example was the Temple Entry Proclamation issued by the last Maharaja of Travancore in the Indian state of Kerala in the year 1936. The Maharaja proclaimed that "outcastes should not be denied the consolations and the solace of the Hindu faith". Even today, the Sri Padmanabhaswamy temple that first welcomed Dalits in the state of Kerala is revered by the Dalit Hindu community. Many Hindus point out that the caste system is related to the Indian society, and not Hinduism (as is evident by presence of caste among Indian Christians and Muslims)]. Hindu Nationalist organizations such as the Rashtriya Swayamsevak Sangh have actively criticized the caste system. Some activists consider that the caste system is a form of racial discrimination. The participants of the United Nations Conference Against Racism in Durban, South Africa in March 2001, condemned discrimination due to the caste system, and tried to pass a resolution declaring that caste as a basis for the segregation and oppression of peoples in terms of their descent and occupation is a form of apartheid. However, no formal resolution was passed to that effect. India's treatment of Dalits has been described by some authors as as "India's hidden apartheid". Critics of the accusations point out the substantial improvements in the rights of Dalits (former "Untouchables") enshrined in the Constitution of India (primarily written by a Dalit, Ambedkar), which is the principal object of article 17 in the Constitution as implemented by the Protection of Civil rights Act, 1955 and the fact that India has had a Dalit, K.R. Narayanan, for a president, as well as the disappearance of the practise in urban public life. (continued from above)Allegations of apartheid are regarded by academic sociologists as a political epithet, since apartheid implies state sponsored discrimination, and no such thing exists in India.India is a sovereign, secular, socialist, democratic republic, and the Constitution of India places special emphasis on outlawing caste discrimination, especially the practice of untouchability. In addition, the Indian penal code inflicts severe punishments on those who discriminate on the basis of caste. Anti-dalit prejudice and discrimination is a social malaise that exists primarily in rural areas, where small societies can track the caste lineage of individuals and discriminate accordingly. Sociologists Kevin Reilly, Stephen Kaufman, Angela Bodino, while being critical of casteism, conclude that modern India does not practice any "apartheid" since there is no state sanctioned discrimination. They write that Casteism in India is presently "not apartheid. In fact, untouchables, as well as tribal people and members of the lowest castes in India benefit from broad affirmative action programmes and are enjoying greater political power." Such allegations have also been rejected by many sociologists such as Andre Béteille, who writes that treating caste as a form of racism is "politically mischievous" and worse, "scientifically nonsense" since there is no discernible difference in the racial characteristics between Brahmins and Scheduled Castes. He writes that "Every social group cannot be regarded as a race simply because we want to protect it against prejudice and discrimination". Paparella those may be the statistics you can locate but the reality is more like Takir Khan describes ... what we consider poverty in the West is every where in Asia in India in China. ... and of course the US where we have some 45 million people without health coverage. Indeed, Plato had it on target: "Poverty has little to do with how much one possesses but with how big are one's desires." The matter given in the above article is very correct. The Untouchability and caste problems are seen in 21st century in many forms and many cases proved this. The only solution to these problems is ANNHILATION OF CASTE. The title is not correct. The author tried to blame the Father of Indian constitution for the failures of the successive governments.It is false to say that Dr.Ambedkar gave dominance to one caste over another.The author has not mentioned what more comprehensive solutions need to solve the caste-related problems. The title of the article is not correct.The caste system in india is part of Hinduism and therefore it can never be removed from Hinduism. Therefor Dr. Babasaheb Ambedkar adviced leave Hinduism and embrace Buddhism Not only he adviced but he also embraced Buddhism on 14th Oct 1956 along with lacs of his followers.Buddhism gives right path to lead life peacefully. Buddhism is completely free from superstition. giving rights to a non brahman to frame law in itself was a heinous crime..the results are there to see...india is still a third world nation..
the title of the article is improper and inappropriate ...it looks to me it was just to make the title influential ...nothing much in content..... i suggest it should be "fall of religion" as the hindu religion in the context was unable to provide basic amenities to the downtrodden community "dalit" leaving them to injustice and inequality(inhuman treatment), there was no way other than to convert to a religion which give dignity to human being"buddhism".